Spey Bay lies on the east side of the mouth of the River Spey as it flows into the Moray Firth. Its main "claim to fame" is the old Tugnet Salmon Fishing Station which lies almost on the river itself. 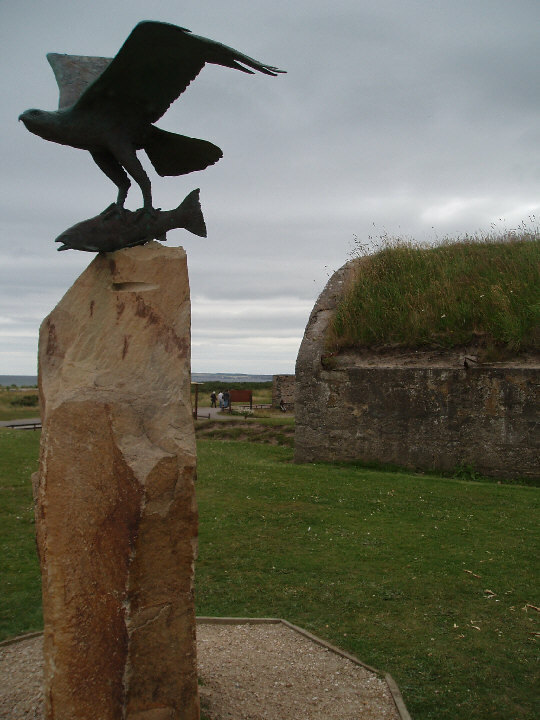 Several parts of this remain on view today and this is a picture of the sculpture just outside with one of the ice houses in the background. The Tugnet Ice House is a strange piece of architecture and is by far the largest ice house in the country, with only a third of its overall size showing above ground. This part of the picture collections of Scottish photographs shows the variety of the Scottish landscapes and natural features which make up the country of Scotland. There are further pictures which show such diverse topics as scottish castles to images of industrial landscapes. This set of pictures were taken by the Young Enterprise group of Loudoun Academy in Ayrshire (2005-06) who sold them to this site as part of their project. The group were particularly successful and won their regional finals.